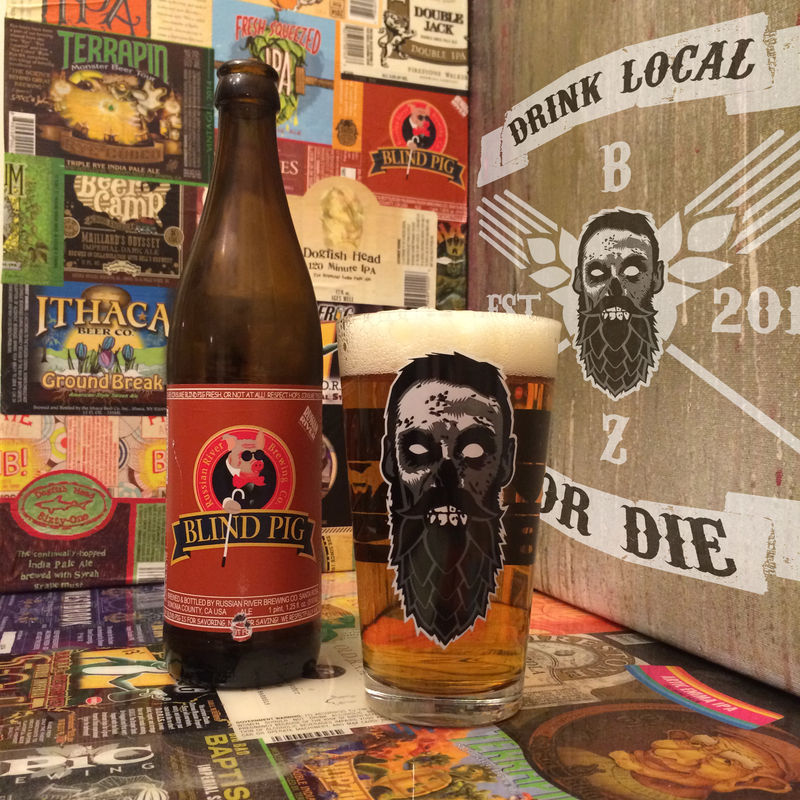 Beer Review – Blind Pig – Russian River Brewing Co. APPEARANCE: Pours a shimmering golden orange, clear and vibrant. Two glorious fingers of white frothy head that settled into a nice dense cap. AROMA: Big ripe and juicy citrus with a delicate resinous hop profile. Not in your face but pleasant and inviting.Tons of fresh fruits, pineapple, mango, grapefruit and lemon zest. A slight bit of grassy aromas lingering around as well. TASTE: Follows the nose very well, that nice subtle hop profile is right there on the first sip. The juicy citrus really comes in and brings that resinous piney hop flavor along for the ride.A wonderful bit of caramel maltiness comes in towards the middle before the slight grassy ending that rounds out the lovely layers. MOUTHFEEL: Medium body with a medium carbonation.Slight oily texture with a long wet finish. OVERALL: Extremely well made and easily drinkable IPA. Not in your face, or over the top just a very well rounded balanced beer. This drinks to me like it’s the base for the big brother Pliny the elder. I know a lot of people compare the two against each other, even though they are entirely different beers. As a stand alone single IPA this is in the very pinnacle of the style! This entry was posted in Ales/IPA, Beer Reviews and tagged #beer, #dtlv, #ipa, American IPA, beer geek, beer review, beer zombies, blind pig, craft beer, golden orange, IBU, las vegas, russian river, tropical fruits, vegas by beerzombies1. Bookmark the permalink.